Next week, anti-G4S campaigners will mark the two years since the death of Jimmy Mubenga during a forced deportation on 12 October 2010. Jimmy Mubenga, an Angolan father of five, died on a British Airways plane at Heathrow after he was restrained by three guards from G4S, which was contracted to carry out ‘escorting’ (deportations) for the UK Border Agency. Jimmy was heard to say ‘I can’t breathe, I can’t breathe’ and ‘they’re going to kill me’ before he collapsed. Jimmy’s family had to wait until July this year for a decision from the Crown Prosecution Service (CPS) on whether the G4S officers or G4S itself would face any charges in connection with his death. They were told that there was insufficient evidence to prosecute, a claim frequently made in relation to deaths in custody. The decision described as perverse by Lord Ramsbotham has left Jimmy’s family distraught. They now await an inquest into his death which will not be held until next year. G4S is infamous for the failings to provide security at the recent Olympics. However, the company has a track-record of failings over the care of people in the private prisons and detention centres they run. In 2008, the charity Medical Justice found in its report Outsourcing Abuse which examined 300 allegations of assault made by people facing deportation, that G4S was the most complained about contractor in reports of alleged assaults. In 2006, 33-year-old Ukrainian Aleksey Baranovsky bled to death in his cell at the G4S-run Rye Hill prison, Warwickshire. An inquest was told how he had repeatedly self-harmed as a protest against his impending deportation after serving a seven-year sentence and feared being killed by the Russian mafia if deported. The coroner called his treatment at the privately run Rye Hill prison ‘shameful and appalling’. G4S guards were involved in the death of 15-year-old Gareth Myatt who died after being restrained by guards in April 2004 at the Rainsbbrook Secure Training Centre in Northamptonshire. G4S’ activities are not confined to security and running prisons and detention centres, the company has recently started providing housing to asylum seekers in the Midlands and the East of England and the North East, Yorkshire and the Humber. These contracts have already been the subject of criticism. The company has also been awarded contracts to run the coalition government’s Work Programme and contracts to ‘help England’s most troubled families’. And overseas, the company also operates security services at checkpoints and settlements in the Occupied Palestinian Territories, and for Israeli prisons. 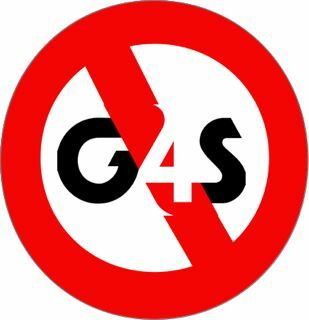 A ‘Stop G4S Convergence’ taking place this weekend in Sheffield will bring together those campaigning against the activities of G4S, in the UK and overseas. The Stop G4S Coalition which has called the action on Friday 12 October outside the offices of the CPS, says that ‘G4S should not be allowed to profit from torture and death and get away with it’. The three men involved (were apparently re-employed by Reliance, the private company that took over the contract for escorting a few weeks after the death of Jimmy Mubenga. Paul Lewis, Matthew Taylor and Cécile de Comarmond, ‘Security guards accused over death of man being deported to Angola’, Guardian, 14 October 2010. Paul Lewis and Matthew Taylor, ‘Failure to bring charges in Jimmy Mubenga case “perverse”, says peer’, Guardian, 20 July 2012, see also letters to the Guardian here. INQUEST press release, ‘INQUEST, family and solicitor response to CPS decision not to prosecute G4S security guards involved in death of Jimmy Mubenga’, 17 July 2012. Home Affainst Committee press release,'MPs call for better monitoring of enforced removals contract', 26 January 2012. Outsourcing Abuse: The use and misuse of state-sanctioned force during the detention and removal of asylum seekers, Medical Justice, July 2008. Charlotte Rowles, ‘The death of prisoner Baranovsky’, Independent, 11 October 2009. See Open Democracy and South Yorkshire Migration and Asylum Action Group (SYMAAG).